180 servings, equal in size to 6 regular cans of ProArgi-9+! The ProArgi-9+ Jumbo Jar is ideal for families and ensures that you have plenty of product for everyone to enjoy. With the ProArgi-9+ Jumbo Jar you are giving yourself and your family the support necessary for a long, healthy life. One serving of ProArgi-9+ contains 5,000 mg of elemental pharmaceutical grade l-arginine. The remarkable properties of l-arginine were validated by the 1998 Nobel Prize in Medicine, and since then have created a frenzy of interest in the pharmaceutical and nutraceutical fields. The efficacy of l-arginine as a therapeutic agent has been validated by thousands of scientific clinical studies. ProArgi-9+ was formulated in collaboration with leading l-arginine researchers such as J. Joseph Prendergast and other cardiovascular specialists who have conducted pioneering research in the proper application of l-arginine in promoting cardiovascular health. These experts have helped create the best l-arginine product on the market. L-arginine is best known for its cardiovascular benefits. In the body, l-arginine is converted to nitric oxide, which relaxes the blood vessels. This reduces stress on the heart and improves circulation. L-arginine is the body’s major source for nitric oxide synthesis. Without nitric oxide, human life would not be possible. L-arginine also reduces blood viscosity. Scientific studies have shown that l-arginine aids in reducing blood pressure levels. L-arginine also enhances health in a number of other ways. It helps improve immune function and stimulate the release of human growth hormone (HGH). It may also boost energy levels, help to build muscle, and reduce adipose tissue body fat. ProArgi-9+ is a unique product with a delicious, naturally sweetened flavor, far-reaching health benefits, and powerful support for the cardiovascular system. 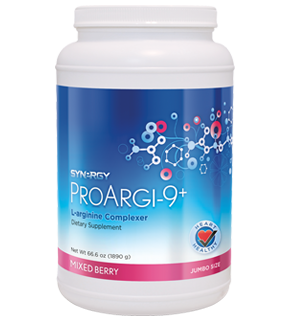 With ProArgi-9+, you’re giving your body the support necessary for a long, healthy life. The ProArgi-9+ Jumbo Jar can be purchased on its own, or together with one box of ProArgi-9+ Single Serve Packets of the same flavor. Mix 1 serving (1 scoop providing 5 g elemental l-arginine) with 4-8 oz. water (depending on individual taste). Stir to dissolve. If water is very cold, mixture will take about 1 minute to dissolve. One serving (1 scoop) may be taken twice per day. Store in a cool, dry place. Slight color changes may occur over time due to the natural fruit flavor. There is no change in the efficacy or potency of the product.